Location Between Bellagio and Mirage Dead centre Strip; this is the marker for other casino’s location. The only problem is that when Caesars was built no one walked on the Strip; all travel was done by car. As a result the casino entrance is about 500 yards back from the Strip. Don’t worry though the good folks at Caesars have put in a series of moving walkways to get you to their machines quicker. Theme It’s Rome, ancient Rome from the spectacular fountains, delightful statues and cypress trees that you pass on your way to the casino to the toga costumes the staff wear. This certainly is ancient Rome with electricity and air conditioning. 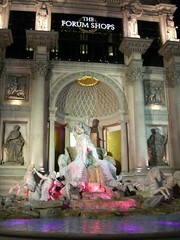 It is a very Grand Rome with loads of marble and gold, everything that can be gold and glittery is gold and glittery. The theme like most of Vegas is completely over the top; but in the best possible way. If there was a casino themed on Las Vegas, Caesars would be it. Las Vegas at its best. Shopping The Forum shops at Caesars is the best casino shopping mall on the Strip. Re-creations of Michelangelo’s David and a copy of the Tivoli fountain compliment the great range of shops; the whole shopping experience here is great. Shops include many usual US high street stores such as Nike Town, Macys, and FA Schwarz but also designer labels such as DKNY, Hugo Boss and Vasari. It must be good, as the average retail turnover per square foot in the US is $300 per annum whereas the Forum shops take $1200. Dining La Piazza Food Court is my favourite on the Strip; you enter together, you chose your different food (Pizza, Salads, Hot Dogs, Chinese etc) get your drinks together and pay together. No queuing up separately just because one of you wants Pasta and the other Chinese. The seating area is lovely, on the edge of the casino allowing you to see the action, sort of inside the branches of a big tree. There is a very small buffet with very long queues and quite high prices (B$15.50 L$17.50 D$23.50, Sunday Brunch $23.50 or $33.50 with champagne) which I have not tried. There are several other high quality restaurants including Hyakumi – Japanese, Bacchanal – a six course Roman feast and Café Roma the 24hr coffee shop. General reports of food at these restaurants are good . Gaming Caesars has 118,000 sq ft of gaming space containing over 2000 slot and video machines, over 70 tables and 13 roulette wheels. Surprisingly there is a very good range of nickel machines here, table limits can be a low $5 minimum but this is only ever one or two tables and only when trade is slow. The layout of the casino is very odd; it seems bitty; like some bits were added on rather as a second thought. Parts of the casino are very dark and others very light. The way in which the floors are arranged makes you very disorientated. I am not sure if this is deliberate or not, but this, along with the expedition back to the Strip does seem to make you stay longer than planned. Drinks Service I found the drink service to be quite good, although I think that depends on where you sit as there are many nooks and crannies which probably do not receive such good service. I always make sure that any cocktail waitress who passes within 20 foot of me knows I want a drink and this obviously helps a great deal. Best Thing Just the whole over the top “we have got it and boy are we going to flaunt it” atmosphere. Worst Thing The distance to the entrance from the Strip and the that Ceasres is confusing easy to get lost and has human traffic jams. Overall If you ask anyone to name a casino (with possibly the exception of Bob Stupak and Steve Wynn) they will say Caesars Palace. Caesars is Vegas and Vegas is Caesars. You get a chance to see “whales” (high rollers) at play and yet still feel like you are a million dollars putting your nickels into the slots. If you are in Vegas and you can only go to one casino, this has to be it. You will not be disappointed. 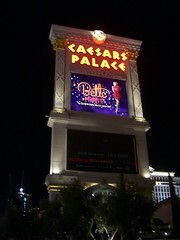 However be aware there is a large expansion program on at Caesars at the time of writing.